It’s finished (first shown in this post)!!! I’m so geeked about how this turned out! I’m calling it my “Storytime Squares Quilt.” I may change my mind about this later but right now I am selfishly hoarding this one for myself. Me, me, me. Elliot saw it right before he went to bed yesterday and said, “Is that for ME?” and when I said, “NO it’s for your MAMA!” he said (and picture the cutest pouty face and puppy dog eyes here) “But I really, REALLY like it.” So I caved and said he could sleep with it for one night. Turned out he was just messing with me and wanted the other three quilts that are already on his bed instead. Little stinker! Please note: You may not email, photocopy, sell, or distribute this PDF in any other way. Please link to this blog post (but not directly to the PDF) if you would like to share this with others. Thanks! If you’re using the printout and want to use FFAII, you’ll have to match up the fabrics I used in the picture above since I forgot to label them on the printout. Campy! ACK, just realized it’s also upside-down! Extra Campy!!! I actually used 100% linen for the sashing and backing which ended up being a bee-atch to quilt with. It’s seriously woobly and slidey-all-over-the-placey. So if you decide you are insane enough to use it too, may I suggest using a spray starch on it (Magic Sizing was recommended by a reader in a previous post and is a buck for a can at Target) both before you cut your pieces and after you piece the quilt top together. I also highly recommend using a SAFE temporary spray adhesive (I used Sulky) to attach the layers before quilting them together. There was a comical Charlie Chaplin-type moment after I spread the backing on the floor and sprayed on the adhesive when I got both hands stuck and tried to use my feet and then realized my feet were stuck too. It was dicey for a bit, but I’m happy to report I no longer have a giant piece of linen stuck to my body. I used a walking foot on my sewing machine for the quilting. To quilt the layers together, I stitched in the ditch around each section of squares and then drew four quilting lines 1/2″ apart between each section with fabric marker before quilting it up. I drew my quilting lines for the outer section just slightly less than 1/2″ apart so that there would be space at the edge for the binding to fold over. 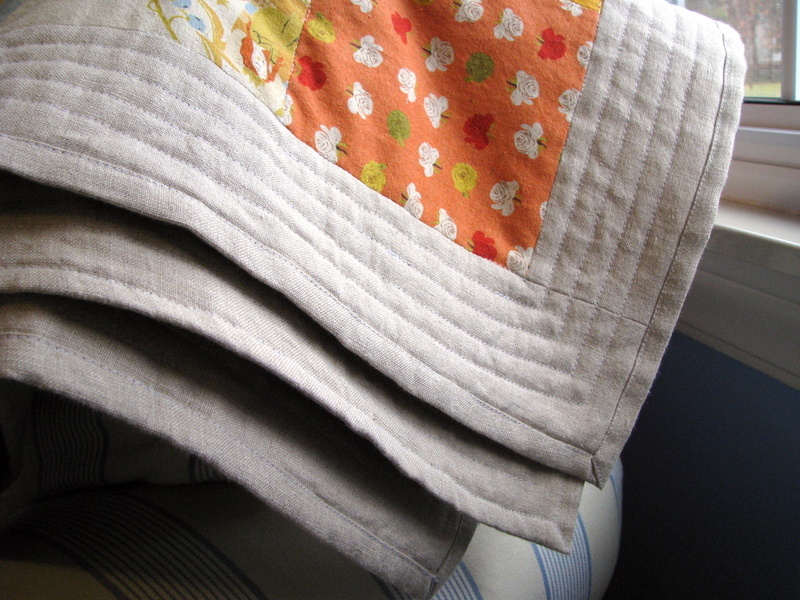 I used my Cheater Bind-off Method (there’s a tutorial at that link) for binding off the quilt. It worked perfectly since the line of stitching I used for the binding lined up just right with the other quilting lines! How about it? Do you guys have other quilting tips you’d like to share? Let me know what you think! I’m feeling very much like a Real Quilter here but I’m sure there’s much more to learn. Wow! I love it! Nice work. And thanks for the quilting with linen tips! I've never tried but I LOVE linen so it's good to know! OH. MY. WORD. Seriously. I am in awe at how beautiful that quilt turned out. I want it. You did a FABULOUS job. It's gorgeous! I think it's fabulous Rae and thanks for sharing your experience! 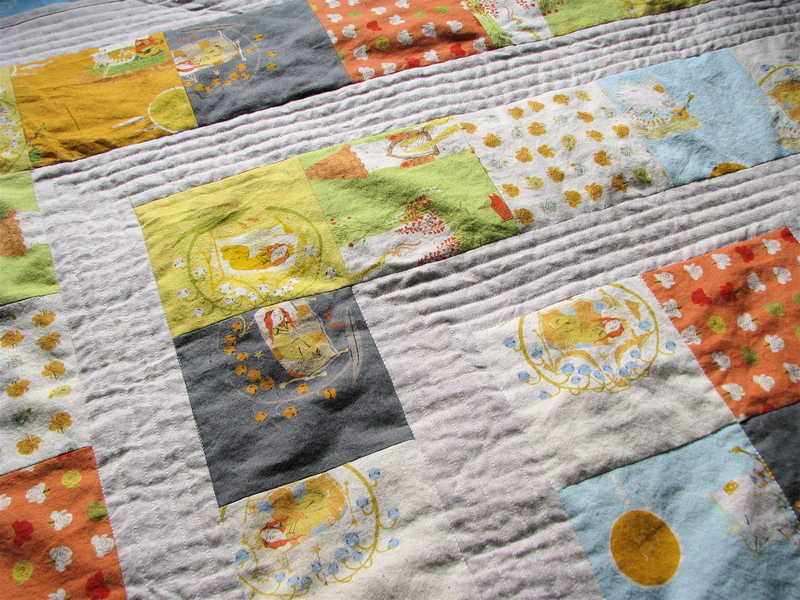 I have some FF@2 that may turn into the same quilt – still thinking about that linen though. This is beautiful and I love love love the way the quilted lines in the sashing look. I may have to attempt this for a new niece or nephew. Gorgeous! I want one! Such fun prints and I love the idea of the linen. I can't seem to get to the pdf…it says document not found? Is it just me? Oh, I think I am in love with this quilt! It makes me wish I was a quilter! I may be getting a rotary cutter and cutting mat for Christmas, so I might just give it a try! bdaiss: just finished messing with it, so it should work now! could someone let me know if it works or not? I looooove it! If I pout and say I really really like it, can I sleep with it for a night, too?? The linen looks great with the Far Far Away fabrics – isn't that always how it is – the best looking things are the biggest pain to sew? This looks GREAT! I love how you left the squares big enough to really see the pattern. And even though it sounds like it was a pain to work with, the linen looks really great. Thanks for sharing the pattern! I've been thinking about trying the spray adhesive, too, since I ended up messing up my last two pin basted quilts, but I have to say being stuck to the quilt doesn't sound too appealing! it worked for me just now! what a great quilt – and i love the images your writing produces… as i guffaw thinking about anyone stuck with batting… !! Ooo, and I think this would look so pretty with Christmas fabrics or even maybe I Spy type fabrics. Definitely downloaded! Thanks! I think I'm going to come to your house in the middle of the night and snuggle with this quilt and eat a bag of cookies while reading a good (or maybe very trashy, can't decide) book and in the morning there will be nothing but some suspicious cookie crumbs to betray me. Soooo delicious looking. And lol@your charlie chaplain moment, that gave me some gigglicious mental pictures. i am officially learning to quilt after the holidays. that is an amazing piece of work. It's amazing!! 🙂 Great work! hullo….it's freaking awesome! I love this quilt! And I just happen to have a FFA FQ set that may need to be a copy cat (minus the linen) 🙂 Thanks for sharing with us! Rae, it's supercalifragilisticexpialidocious. And I don't throw that word around for just anything. Nicely done! Bee you ti ful. Thanks for the PDF. I so want a walking foot. It looks so comfortable and snuggly…I just want to cuddle with it! Great job! oh Rae! I absolutely love it! BEAUTIFUL!! Oh my that is so beautiful! I love it. Thanks for the pattern. I love it Rae!! So so beautiful. I would keep it for myself too! You'd better hoard some fabric so that if I ever spawn you can make one for my progeny. I'm in love! I'm due some fabric for Xmas and I want FF2. Oh my, that is so pretty! I love the fabric! You did an FABULOUS job! Love the tips and the fabric! This turned out great, and I love the quilting design that you choose – it really shows off the prints. I've actually never used spray adhesive for basting (I'm a safety pin girl), but after seeing so many posts about it, i think I may need to give it a try! Very nice Rae! I love it! Thanks for sharing this quilt! I love that it's colorful and fun, yet simple and modern. Perfect! I'm new to your blog, but have already made the "Buttercup Bag". I can't wait to try out more of your ideas; you are inspirational! This baby is a stunner! I would keep it for myself also! Beautiful Rae! Love how you did the quilting! I love the quilt and totally laughed picturing you with both hands and feet stuck, and about linen is a bee-atch. I just made a quilted thanksgiving table runner with linen and it's so shape-shify! I'm not a quilter, but I'm being inspired to do some more quilting anyways- thanks! Beautiful! I do have some tips on the spray basting for you. I tape the backing down with painter's tape on the corner (the blue low-tack tape). Then I don medical latex gloves (! ), spray one side of the batting, and spread the batting on top. Spray the other side of the batting and pat the top on. It's increadibly gorgeuos, I admire your sewing skills. Thanks for sharing your awesome quilt pattern! Love it!! I rarely abandon my knitting needles long enough to quilt, but I think this just might be tempting enough. Thanks for telling us how you did it! Perfect!! I had planned a very complicated quilt using my FFA2, but I decided it didn't showcase the prints enough–this is absolutely the answer. Am totally using your pattern, making it bigger, and keeping it all for myself. You are my HR role model. PS My authentication word is "basty." Tres quilty! SO SO Beautiful! I'm a lurker and haven't ever commented on your blog but I think this is a masterpiece! So perfectly symmetrical and pleasing to the eye! That is absolutely beautiful! I can't imagine the time that took. This is fantastic! I love the fabrics, and it looks so comfy!! Just wondering what the finished size of this one is? Love it! This is beautiful! 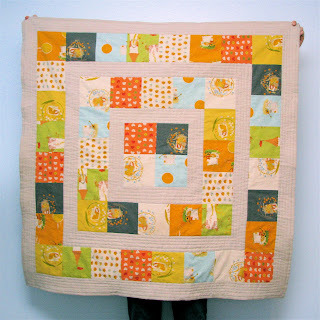 I love the fabrics, I love the layout, and I love the quilting pattern. I just bought some Dr. Seuss fat quarters, which will be much louder than your fabrics, but I think I'll try this pattern anyway. So fun! Beautiful! I adore the fabric you've used and the design you've set it out in. I love the quilt and I love the cheater bind off method! 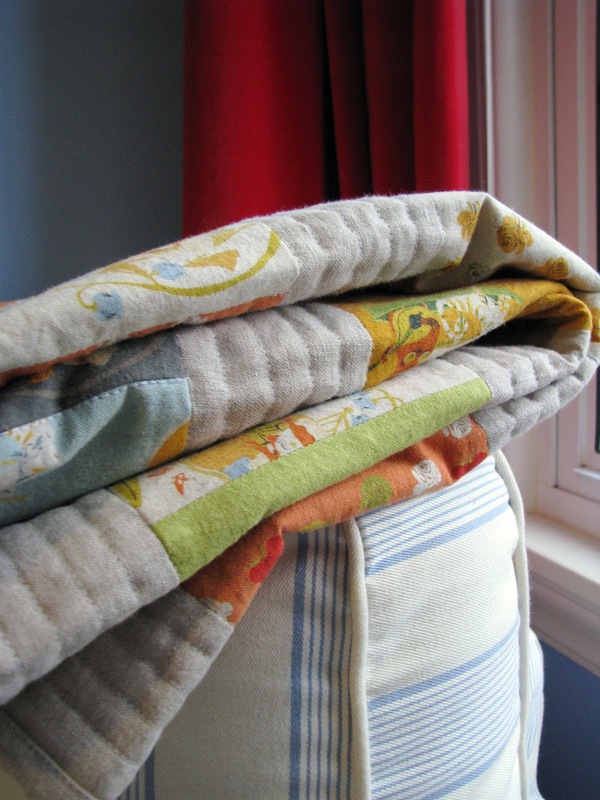 I have been able to do several quick blankets using the method. 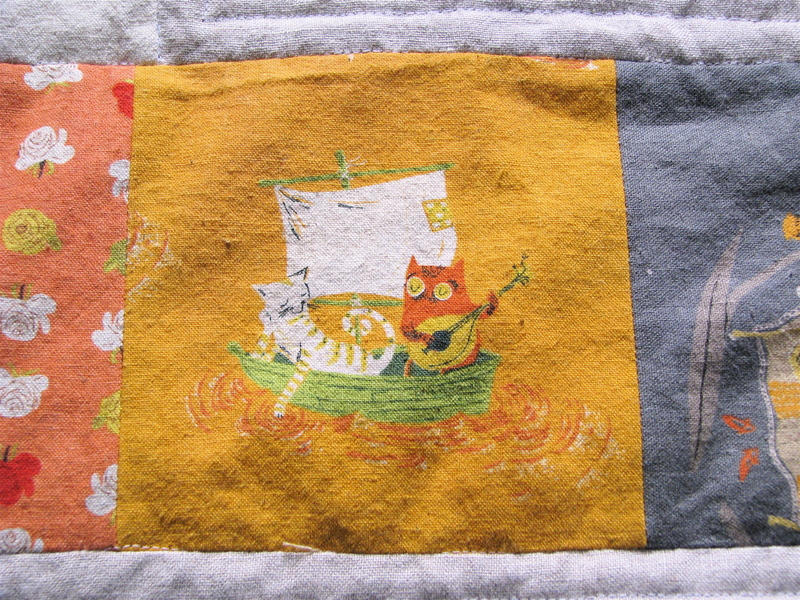 And it isnt easy but it works with minkie which makes a great backing for baby quilts. I finshed a blanket tonight in 2 hours that would have taken three times that with binding. Thanks again! Gorgeous Rae! You can never go wrong with HR or natural linen. Beautiful job. Thanks for sharing! I've been absolutely hoarding my Far Far Away fabrics…now I know why. My quilt will also be just for me. I think such happy prints will ensure sweet dreams. Oh my! I love this! I love the way you quilted it, FFA and that you gave a tut! Thanks!! I really like this, and it would give me a purpose for that fat quarter bundle I bought just cause it was so pretty! OMG! There seriously is no end to what you can do! You amaze me! Gorgeous! Absolutely stunnin! I just want to take it and snuggle in it. I'm going to have to add extra tweets to you this week now just to keep up with how amazing you are…hahaha! Holy mackrol! It's incredible and the linen is fabulous. From my point, definitely worth the debacle. Rae!!! I love it, nice work! I have only made one quilt, all Amy Butler fabric for my mommy who is a very talented quilter. It took me 9 months to finish, and I love how it turned out but hadn't really wanted to quilt again after that…until I saw your quilt, it makes me want to give it another go 🙂 You should keep it for yourself, as moms we are rarely selfish and every now and then we need something just for us. Wow, that's really gorgeous! Thanks so much for sharing the project sheet, I'll be spreading the word. I just jumped over from Whipstitch. Love the quilt! I'm such a fan of the simple, big piecing that allows a collection to shine. Now, where have I been? Why don't I follow you already? Let's fix that. This is wonderful! Thank you so much for the generous pattern. I love it! Thanks for the tutorial. oh Rae, it's so lovely! I really want to make one. I've been needing a new pattern, I've made three 4 inch squares quilts and this will be the perfect next step. I've been looking for a quilt pattern for some squares I already have cut! I love the look of this, and think the little girl I'm making the quilt for will like it too! Oh, I'm so excited!! Thanks for the pfd and tips!!!! I just love this quilt! The quilting is especially Fabulous!! amazing, i'd like to have your precious hands! Ugh… I LOVE!!! You did a great job. Thanks for sharing the pattern! I need help – I missed the "54" wide fabric" detail on the PDF pattern (oops), and my sashing fabric is only 44" wide. I'm done with the quilt save for the last two long outside sashes (#11s on the PDF) – but I'm out of fabric and I've realized that the selvage-to-selvage measurement on the fabric I was using wasn't long enough, anyway, to do those pieces. I'm kind of in a bind (pun intended) – I was hoping to have the quilt done by Saturday as a gift for a shower, but now I'm a bit stuck. Any suggestions? I figured I'd buy a twin flat sheet for the backing, but I'm not sure if I should pieces those last sashes together or figure something else out. I hope you can help me – the quilt is beautiful so far, I just need to fix this little hiccup! Oh my gosh! I bought all those same fabrics for Christmas, and haven't yet found what I wanted to make with them. You may have just solved that problem. This is so beautiful! I'm curious as well about the finished dimensions. What do you think it measures? Thanks so much for the PDF. That's so super nice of you. I know they take forever to make. I absolutely LOVE this quilt. Thanks for sharing the tutorial!!! Rae I have been looking for simple clothes and patterns for my two girls. I need look no further, your site is lovely, and your patterns are gorgeous. Thank you! Thanks for the pattern and info Rae. Looks like one that will be a good charity quilt. Love yours. Sarah @ Confessionsofafabricaddict sent me. I really like this! Thank you in advance! FYI. 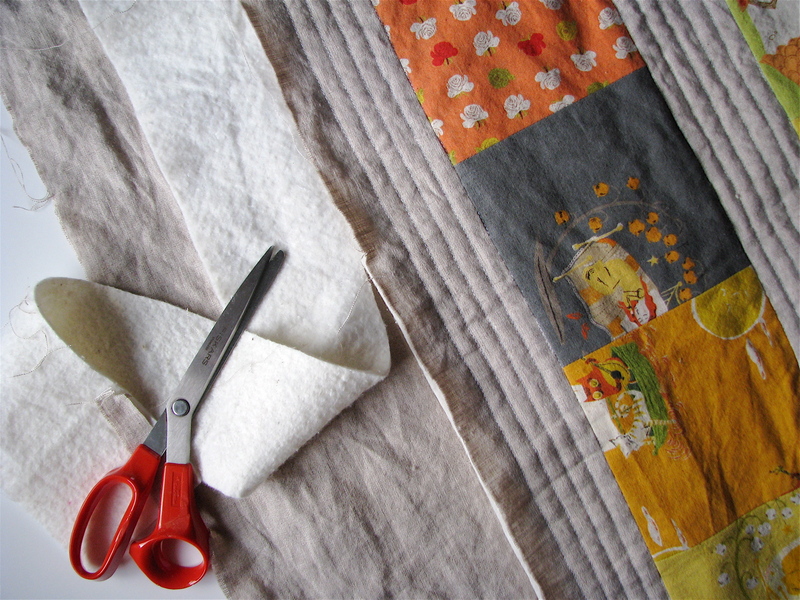 I am in the midst of making the Storytime Squares Quilt using a forty piece charm pack. Alas I discovered I did not have enough squares, because there is a misprint in the pattern. The first line in parenthesis says, “Cut six 5.5″ from each fat quarter to make 40 squares total.” (It should say “48 squares total.”) When I saw the 40 I immediately grabbed a charm pack. I just thought you might like to correct the pattern in case anyone else wants to us to use a charm pack and find they are short. I was able to find another charm pack in the same fabric. I love the pattern and will be making a few more for charity. Thank you for sharing your expertise. Thanks Patty — I’ll get that fixed as soon as possible! I have saved this pattern until today. I have been on a charm pack buying binge (cringe) lately. I’m ready to use them and I like the way you’d done it without the end result being simple squares (which I happen to love also). Can’t wait to starting cutting! I love, love this quilt! I am sewing quilts for people with cancer (strictly a volunteer group) and I would love to use your pattern! This pattern would be ideal for babies and young children! I love the Cheater bind off method.Easy and quick and just as pretty. 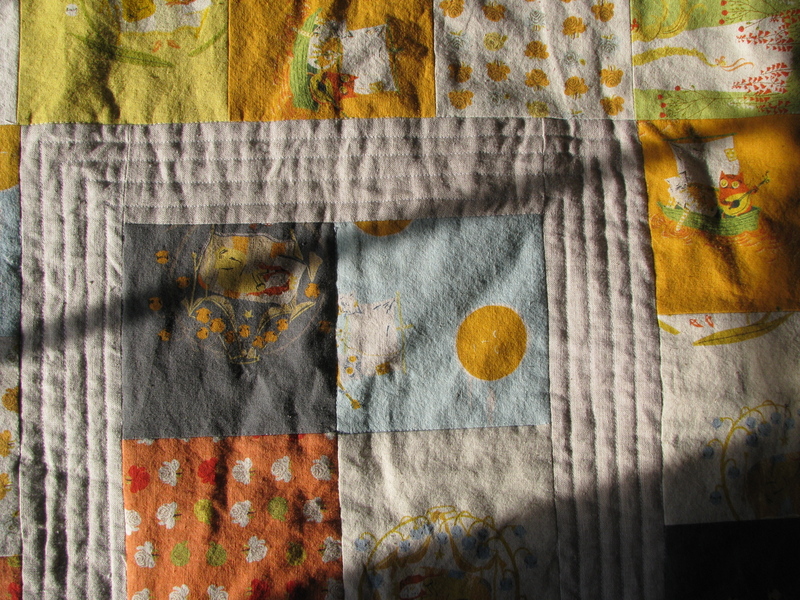 i wish i could be more original – but I love this quilt too. It’s so cute. I agree with the earlier post it would be cute for a christmas gift. Has anyone tried it with a charm pack? Thanks a lot for the wonderful tutorial and pattern! I made the quilt as a baby shower gift (along with the newborn pants) and it was a hit! It was the first quilt I’ve even made and I’m hooked. Can’t wait to make the next! So cute! I love the design and how you quilted the sashing. 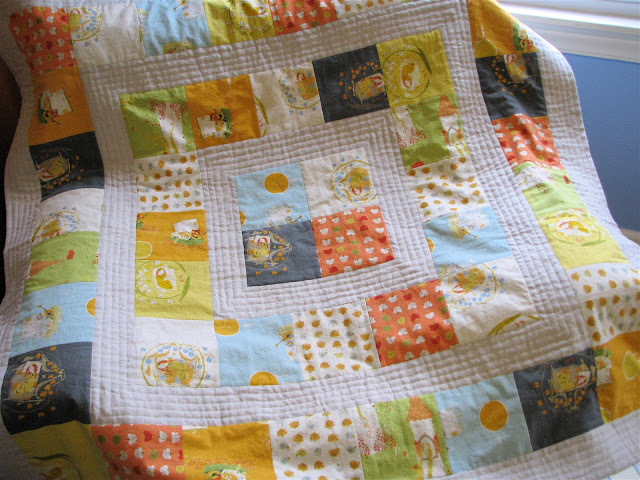 this has got to be the cutest (and easiest) quilt for babies…. 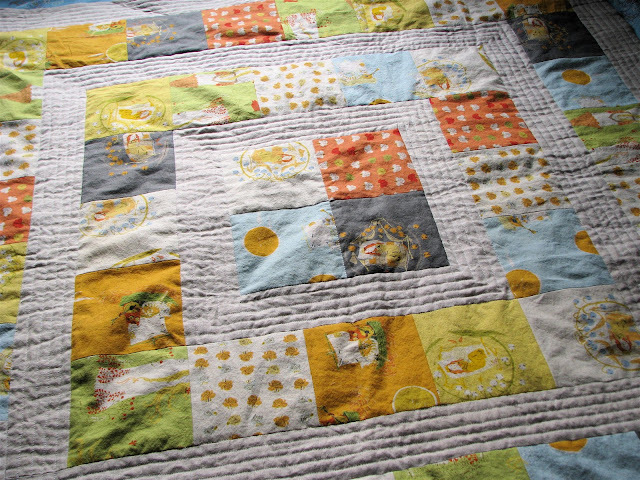 thanks for sharing… i make babyquilts for my numerous nieces and friends babies…. I know I’m late to this party, but…This is a great design! I can’t wait to try it in Winter, Spring, Summer, Fall-type patterns. Or Disney/comic book characters. Or sports, or vehicles, or fruits/vegetables. Or basically any 4 fabrics that look good together. Instead of fat quarters or charms, you could use any bolt fabric, cut in strips any width you want, sew strips together, then cut cross-wise to make strips of squares. Easy way to make sure your patterns stay in the same order. I am about to start quilting this quilt but I’m confused about where to start the quilting. Do I start on the middle 4 squares? 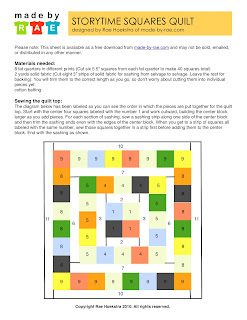 and did you quilt all the way around each square or only the outside of each square? It looks like you only did the outside but its hard to tell in the photos.